An Iranian-American businessman and his elderly father each received 10-year prison sentences from Iran for “spying and cooperating” with the United States. 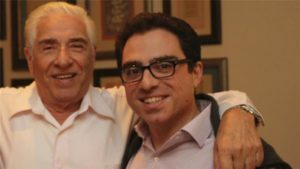 Siamak Namazi and his father, Baquer Namazi, were sentenced by an Iranian court, Iranian media reported on Oct. 18. The Islamic Revolutionary Guard Corps (IRGC) detained Siamak Namazi, a businessman in his mid-40s with dual U.S.-Iranian citizenship, while he was visiting family in Teheran in October 2015. The IRGC in February arrested his 80-year-old father, Baquer Namazi, a former Iranian provincial governor and former UNICEF official who also has dual citizenship. U.S. State Department deputy spokesman Mark Toner said the father and son had been “unjustly detained” in Iran, and called for their immediate release. Babak Namazi, Siamak’s brother and Baquer’s son, called the sentences unjust. The father and son were each given a single court session lasting a few hours before the sentences were given, Babak Namazi said.